DCC #91.2: Lairs of Lost Agharta: Creatures and Lairs in the Center of Aereth is a supplement to DCC #91: Journey to the Center of Áereth. It was written by Steven Bean, Daniel J. Bishop, Tim Callahan, Stephen Newton, and Terry Olson, with Harley Stroh. Art is by Doug Kovacs (cover only), Steve Crompton, and Stefan Poag. Cartography is by Steve Crompton. The publisher is Goodman Games. Disclosure: I am one of the authors on this project.Specifically, if your characters fall victim to the Maleves or the No-Men, you have me to blame. 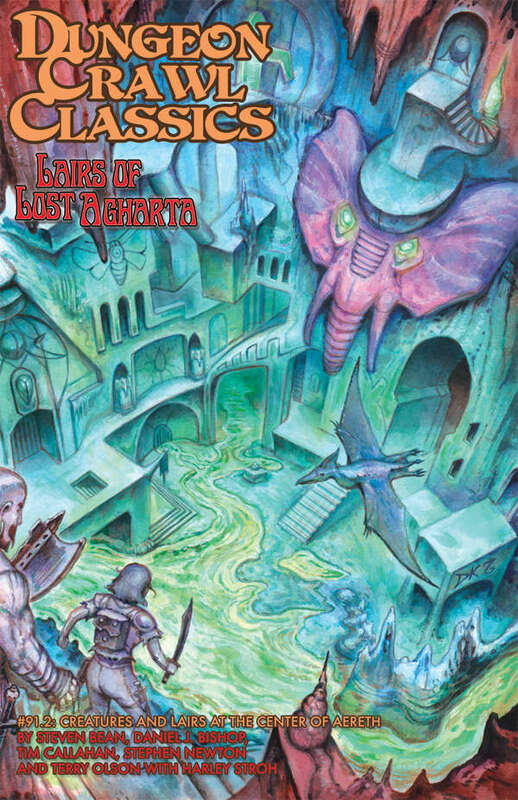 This work is fairly new at the time of this writing, and is a compliation of creatures and beings you might encounter in the Center of the Áereth, along with random encounter tables and an appendix to generate "Marooned Mortals" on the dim shores of the inner world. There are 13 creatures/lairs in this digest-sized book, but there are more than 50 pages of material, so nothing is given short shrift. Of course, anything can be reskinned to fit other campaign milieus, but everything you encounter herein has been designed with Lost Agharta in mind. While it should go without saying that combat may occur, not everything herein is necessarily a "combat encounter", either. Sages will aver that the denizens of the underworld are, by necessity, alien to surface dwellers such as ourselves. Few will ever stand on the ink-black shores of the Lost Agharta, and even fewer will return to tell the tale. Those that do, report creatures transmuted by their deadly environs and the weird gloom. These creatures of legend owe no allegiance or kinship to the beasts of our lit-realms, and woe to the adventurer who mistakes them for a familiar foes. Collected herein are thirteen of the stranger beings explorers may encounter upon their arrival at the very center of our hollow globe. This is certainly not an exhaustive list, if such a thing could even exist – for the underworld is vast, and our knowledge is slight.